From Immigrant to King of an Empire. Vic Tanny was born Victor Tannidinardo in Rochester, New York on February 18, 1912. He would become a pivotal figure in the history of bodybuilding. Vic’s father, a tailor, and the rest of the family, changed their last name to Tanny sometime in the late thirties or early forties due to anti-Italian sentiment at that time. 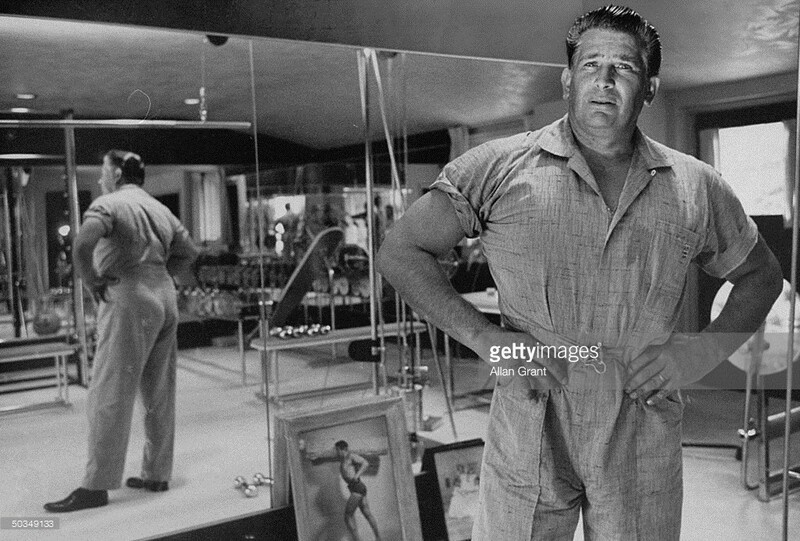 Vic Tanny, who had always been interested in physical strength and conditioning, opened his first gym in his parents’ garage in 1935. Eventually, he would move to a larger building in Rochester but was disappointed with his volume of members. Vic had always admired the early American pioneers and their struggle to move west so, in 1940 with $700 in savings, he moved to Santa Monica, California. Tanny’s first attempts at operating a gym were a struggle, especially during the war years. Many of his potential customers joined or were drafted to defend the nation. The prosperity that followed the end of the war saw Vic’s gyms skyrocket in popularity. With chrome plated weights, his brightly lighted, colorfully painted establishments welcomed women and men to an almost country club atmosphere. Tanny’s gyms were clean and bright as opposed to the dimly lit, smoky and dirty boxing gyms he had visited as a youth. Between 1950 and 1959 Tanny went from one gym to over 60 nationwide with 650 employees and hundreds of thousands of members. Vic Tanny’s gym motto was Take it off, build it up and make it firm. This was accomplished by lifting weights but every member was cautioned against overstraining and grunting and groaning. Members were put on an initial 3 day a week program of 30 minute duration which included 24 Tanny approved exercises. Memberships were $60 per year on the west coast and $125 per year in New York due to higher costs there. A lifetime membership could be purchased for $339. Vic Tanny was not the creator of the popularity of exercising at that time. There were over 750 “reducing” salons nationwide in 1958 with such names as “Silhouette” and “Slenderella”, but he was one of the leaders of the movement. Vic accumulated quite a fortune from his gyms. In 1958 he and his family lived in a $220,000 mansion with 12 phones! 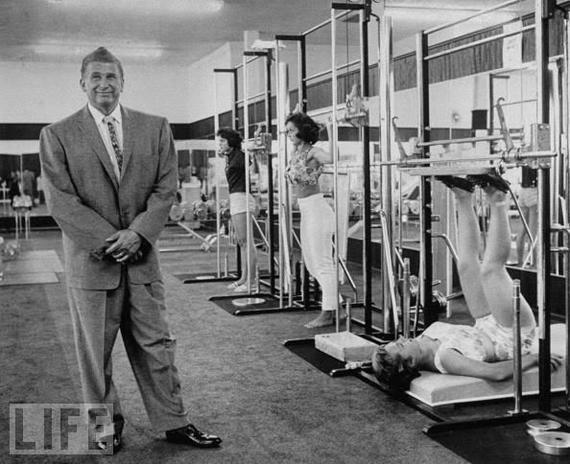 Vic Tanny’s name became synonymous with gyms, muscle building and fitness. 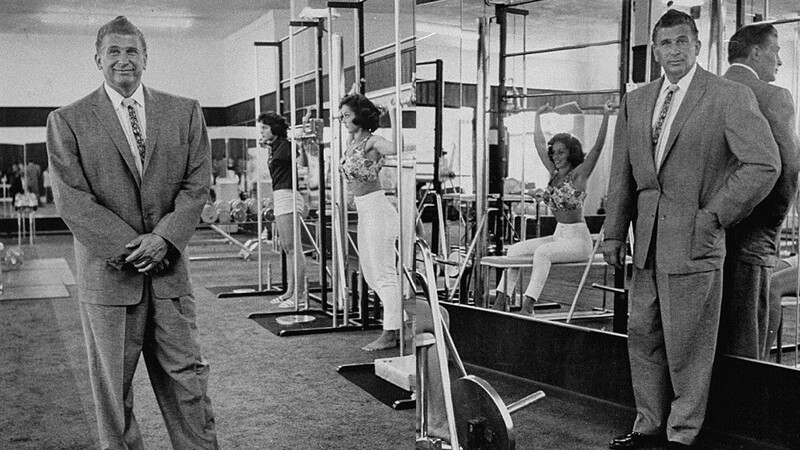 A parody of his gym is seen in the 1963 movie “The Nutty Professor” with Jerry Lewis. Don Rickles plays a trainer of bodybuilders, “Jack Fanny”, in the movie “Muscle Beach Party” and “Mad” magazine has even parodied Vic in their “Vic Tinny” issue. Vic Tanny dreamed big and achieved even bigger! His dream was to spread his gyms all over the world. Tanny may have dreamed a bit too big. Eventually, Tanny’s business fell into bankruptcy due to “over-expansion, poor management and lack of capital” according to those in the know. Vic retired to Florida and many of his gyms became part of the Bally gym chain. Many of Vic’s family were also interested in the heath and fitness industry. Vic’s mother, Angela Tanny, was a lifelong health advocate. She followed her son to California and worked out regularly at his Santa Monica club. It worked well for her. She lived to be 94 years old, passing in January of 1986. Armand Tanny was Vic’s younger brother. Armand competed in weightlifting early in his career but later turned to bodybuilding and wrestling. He had a career of writing for the Weider publications. Armand appeared in 2 films in 1944,”Lady in the Dark” with Ginger Rogers and “Frenchman’s Creek” with Basil Rathbone. Armand died on April 4, 2009. He was 90 years of age. Vic Tanny Jr. was a successful Iron Age bodybuilder in the seventies. Mandy Tanny, Vic’s niece, wrote for Joe Weider’s “Muscle and Fitness” magazine for 10 years and penned 2 health food cookbooks. She and her husband developed a chain of gyms between 1990 and 2003. Sadly, Mandy passed away from breast cancer in April of 2010. She was 60 years old. Vic Tanny, the young immigrant boy who grew a bodybuilding empire, died of heart failure on June 11, 1985. In spite of how his empire may have ended, he will always be remembered for his contribution to the health and fitness industry and the Iron Age era of bodybuilding. Rest in peace Vic Tanney.